The Programmable Signal Generator can generate a square wave from 1kHz to 68MHz. The circuit is based on the Linear Technology LTC6904  I2C programmable oscillator, and it's controlled by an ATtiny85. I needed a signal generator for other projects I'm working on, such as testing processors running with different external clock frequencies, and because I needed frequencies over 20MHz my earlier Tiny Function Generator wasn't suitable. I therefore chose the interesting LTC6904 programmable oscillator which is available from Farnell  or RS-Online . I initially thought of displaying the frequency on two 4-digit seven-segment LED displays, which would require at least 11 pins to drive them and so need an ATtiny2313 or larger; see Driving LED Displays with Fewer I/O Lines. However, the thought of wiring up the displays on a prototyping board soon put me off the idea, and nowadays an I2C OLED display is a much more attractive option; in fact I think seven-segment LED displays have almost had their day. Combined with my One Input Keypad Interface I was able to use an ATtiny85 as the controller for the whole project, and wire up a prototype on a breadboard in under an hour. I'm not sure why they chose the constant 2078. For a desired frequency you need to calculate the OCT and DAC values, and so it's useful having an ATtiny85 available to do the arithmetic. My program works as follows: you enter the frequency you want, in Hz, as a sequence of up to eight digits, and press *. The display then shows the nearest frequency that the chip can generate, and generates the square wave on the output. Pressing # at any time clears the current input. The circuit of the Programmable Signal Generator. I built a first version of the circuit on a prototyping board, using an off-the-shelf keypad . The circuit board is designed around low-cost through-hole tactile buttons that you can get from suppliers for as little as 4 cents/pence each , or less from Banggood . The display is an OLED 128x32 I2C display module using the SSD1306 driver. I used a low-cost module from AliExpress  held in place with a double-sided self-adhesive foam pad. The PCB also accommodates Adafruit's version . The back of the Programmable Signal Generator PCB showing the surface-mount components. The power supply and oscillator output are accessed via a 4-way connector at the edge of the board. The program consists of three main sections to handle the keyboard, display, and interface to the programmable oscillator chip. The keyboard interface is based on my earlier One Input Keypad Interface, which uses carefully chosen resistors to give a different voltage at an analogue input for each key on the keypad. The display interface uses the same routines as my earlier Tiny Function Generator, which used the same I2C OLED display. The frequency is plotted using double-sized characters; this gives a maximum of 10 characters on the line, which is just sufficient for the 8-digit frequency and the "Hz" suffix. This routine implements the calculation on the LTC6904 datasheet, with a bit of juggling to keep the intermediate calculations within the range of long (32-bit) integers. It returns the parameters packed into a 16-bit word, with the 4-bit OCT value in bits 10 to 13, and the 10-bit DAC value in bits 0 to 9. For frequencies in the low kHz the generated frequency will usually match the target frequency typed in, but since the programmable oscillator only aims to get to within 1.1% over the whole range, at frequencies in the MHz there might be a difference of a few kHz. For example, if you type in 32000000 (32MHz) the actual generated frequency will be 31981568Hz, an error of 0.06%. int cnf = 2; // Only CLK output enabled. Another routine, SendSilence(), is used to disable the oscillator output while you're selecting a frequency. I compiled the program using Spence Konde's ATTiny Core . Choose the ATtiny25/45/85 option under the ATtinyCore heading on the Board menu. Then choose Timer 1 Clock: CPU, B.O.D. Disabled, ATtiny85, 1 MHz (internal) from the subsequent menus. Here's the whole Programmable Signal Generator program: Programmable Signal Generator Program. Alternatively, get it on GitHub here together with the Eagle files for the PCB: Programmable Signal Generator on GitHub. 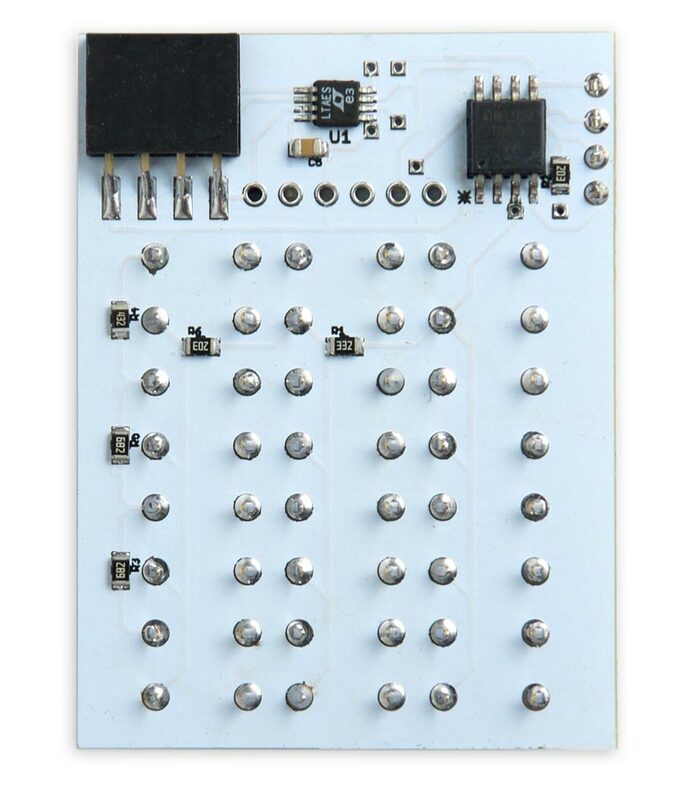 Or order a board from OSH Park here: Programmable Signal Generator Board. Despite the fact that the programmable signal generator has an impressive 16-octave range, for some applications it would be nice to be able to extend the lower end of its range below the current minimum frequency of 1039Hz. One possibility would be to use one of the ATtiny85's Timer/Counters as a frequency divider, taking the input on one of the two spare I/O lines and giving the output on the other one. ^ LTC6903/LTC6904 1kHz to 68MHz Serial Port Programmable Oscillator on Linear Technology. ^ LTC6904 Timer, Oscillator & Pulse Generator on Farnell. ^ Linear Technology LTC6904 Voltage Controlled Oscillator on RS-Online. 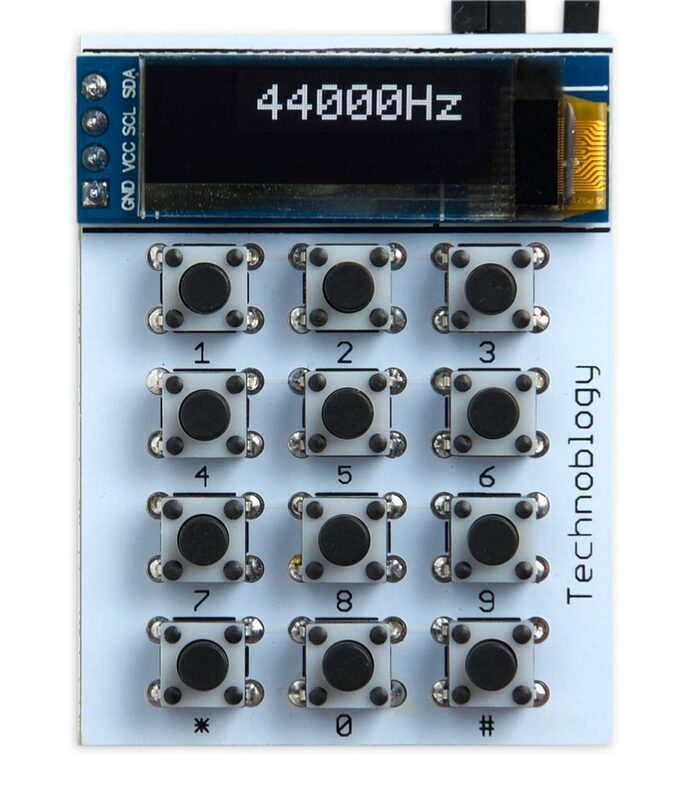 ^ 4x4 Keypad MCU Accessory Board on AliExpress.